I am directionally challenged. If you asked me to face north on any given day I would likely point up, unless it is sunrise or sunset, and then I'd at least have a little help. So to be in Istanbul, where I was told the north part of town is the most "Western", the south part of town is Europe and across the water to the east is Asia, it is safe to say I wasn't sure which continent I was on during my time there. Whatever direction I faced, though, there was a epic amount of culture, thanks to the city's strategic location and storied past. The Blue Mosque of Istanbul. We saw many of the classic sites in Istanbul/Constantinople/Byzantium none of which disappointed and all of which shed light on just a few chapters of the city's history. To begin, we saw the awe-inspiring Blue Mosque. Or I should say that we heard it first as the call to prayer warbled into our hotel room early on our first morning (and the second morning and the third morning...). Minarets, the towers of a mosque, puncture the skyline throughout Istanbul but those of the Blue Mosque are unrivaled in the city. The mosque was built in the 17th century by Sultan Ahmet to rival the Hagia Sophia, and naturally, the creation was named after him (Sultanahmet Camii) but was given the name the Blue Mosque for the thousands of blue-hued tiles that decorate the interior. Since the mosque is still used as a place of worship today, all visitors must meet the standards in order to enter. That means long pants (or skirts), shoulders covered (down to the wrist for women) and head coverings were required for women. You also have to remove your shoes. I don't know how many visitors the mosque receives in a day, but it is certainly enough to make the air smell faintly like a locker room. Odor aside, the interior of the mosque is stunning. Gilded Arabic writing of holy verses, soaring ceilings, and of course, blue tiles make it a beautiful place to worship. Inside the Blue Mosque. It doesn't look very blue here but it's quite lovely! Literally across the way from the Blue Mosque is the Hagia Sophia, which was built by Emperor Justinian in 523 AD and finished just five years later. Considered the Vatican of the East for nearly a millenium, it is still the Byzantine Empire's singular greatest architectural achievement. The Hagia Sophia - Aya Sofya, meaning Divine Wisdom in Turkish - exudes ancientness. Many guidebooks tell you to look up - the structure is so tall that Notre Dame would fit under its roof of golden mosaics and stark white marble, and the innovation of the dome's architecture is astonishing for the time period. There were some miscalculations, though, as the dome collapsed more than once and had to be rebuilt. The ground floor also holds its own secrets. I watched dozens of visitors breeze right past a placard of a roped off area to the side. The circular stones inside didn't seem special, but in fact it was the place where emperors were crowned. In 1453 the church was converted into an imperial mosque thanks to the Ottoman takeover by Sultan Mehmet the Conquerer, whose was impressed by its beauty, and it remained a crucial place of worship for about five centuries. My camera could never do the Hagia Sophia justice. Not many could. You can still see some of the conversions of it from a church to a mosque. For example, the nave of the old church now has a mihrab that sits oddly off center in order to direct worshippers to Mecca. The faces of the seraphim frescos were also covered up to adhere with Islam's art culture which only allows for geometric shapes, calligraphy and florals - no human or animal forms are represented. Though much of the golden grandeur was lost, the place is well preserved enough to imagine that Emperor Justinian might have proclaimed "Solomon, I've surpassed you!" (so the legend says) upon opening its doors. 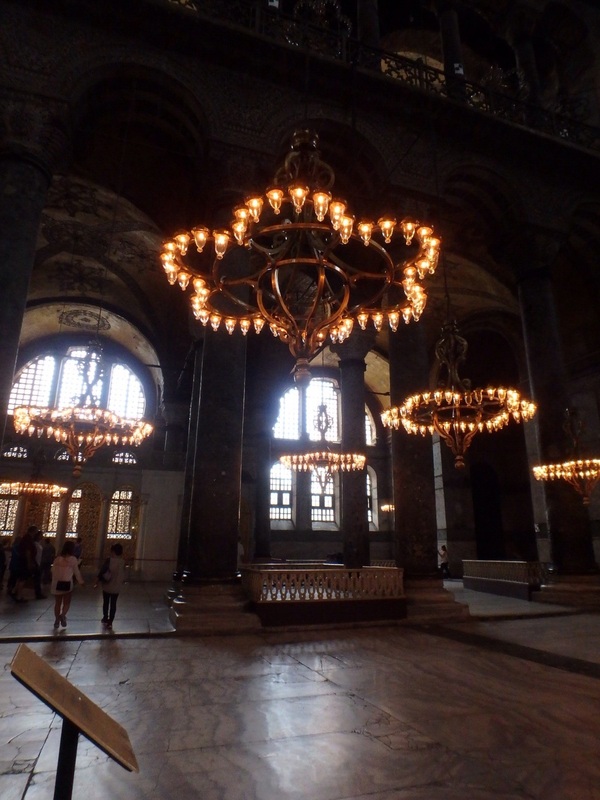 Simply put, the Hagia Sophia is among the more astonishing places I've seen, and thanks to its conversion to a museum in the 1930s you don't even need to take your shoes off to enjoy it. "I've got a blank space, baby, and I'll write your name." Taylor Swift's hit song has nothing on Empress Zoe. This mosaic shows her husbands - I put it in the plural due to her multiple (monogamous) marriages. Instead of redoing the mosaic with the face of her new betrothed, the artist simply redid the name and title over the man's face - you can see how it the work looks a little sloppy above the man's head. We have seen many ancient sites and evidence of old traditions on this trip, so I was grateful to be in Istanbul for the first day of Ramadan, the Islamic holy month. During this time Muslims fast from sunup to sundown in an effort to understand the struggles of their fellow (poorer) man. I've heard the first day of waiting for Iftar (the time of sundown when the fast can be broken) is the hardest. In Istanbul we saw many picnic tables, chairs, food and gift stands set up in the center of town, ready to celebrate the start of Ramadan. The tables and chairs were all empty during the day because of the fasting, but once the sun began to sink people poured in from everywhere to break the fast together. Restaurants around this main square, called the Hippodrome, were packed, and all of the tables showed families clustered together with their meals untouched on the tables. Enjoying the city is an understatement! The Blue Mosque is in the background. At one end of the square there was a small continent of military personnel and a cannon set up, which went off at the precise time of the sun setting, and then the meal commenced. This event was was reminiscent of a festival, with camera crews covering it for local news and what I believed were local government and religious leaders giving a speech before the meal. After enjoying the festive air for a few moments, Jonathan and I had our own meal on a rooftop terrace with a view of the Blue Mosque, which I am proud to have learned faces east to Asia - and points to our next adventure. The courtyard in front of the Blue Mosque welcomes visitors.